TimeTools has a range of active GPS splitters. A GPS splitter splits the output from a single antenna and shares it between multiple receivers. By utilising a GPS splitter, a number of GPS referenced NTP servers can share a single antenna. Large savings in installation costs of multiple antennas and cabling can be achieved. 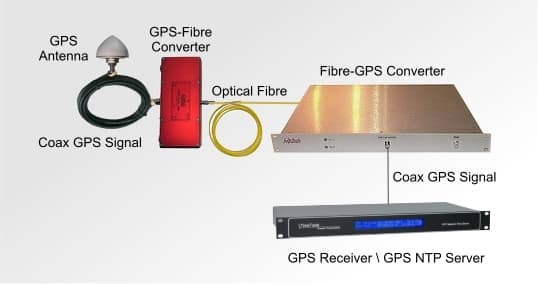 A GPS over fiber link system allows GPS signals to be transmitted with minimal losses over long cable distances. It provides a highly secure link between a GPS antenna and receiver. It is also resistant to noise, allowing an interference-free link through noisy environments. The technology transparently provides cross-site connection between a GPS antenna and receiver unit.